The biggest US strike in years enters its second week today, as 45,000 employees of Verizon walk picket lines on the east coast. Despite over $19 billion in profits and paying out over $258 million to just 5 top executives, Verizon wants $1 billion in concessions from its workers, the majority of whom are represented by UPTE’s national union, the Communications Workers of America. 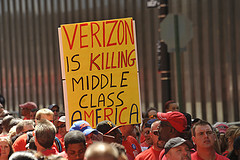 Learn more by watching this national news coverage, or visiting at CWA’s Verizon page. California's new budget is already facing a nearly $539 million shortfall in the first month of the new fiscal year according to state controller John Chiang, which could lead to even even deeper budget cuts for public education, health, and social service programs. Cuts have already severely affected agricultural programs at California’s land grant and agricultural colleges, and have caused budget reductions at UC’s agriculture-related programs of up to 20 percent. UC San Diego is predicting more staff layoffs, while in a likely sign of things to come, Big Pharma is now providing $50 million to UCSD for collaborative research projects. UC Davis and UC Berkeley are closing classrooms due to concerns about seismic safety, as money to upgrade or replace them has disappeared. We shouldn’t be surprised that some students in desperation are resorting to bake sales to raise money for college. And in reading these grim reports, we should remember that the severity of the current budget crisis is due to the intransigence of California Republicans to consider even minimal tax increases. The argument that big salaries are needed to attract qualified leaders is "a self-fulfilling prophecy that debases the ideal of pubic service," according to a Sacramento Bee editorial, which complains that the "exorbitant salaries for CEOs in the corporate world and at California's universities are now widely infecting local governments." Despite faculty skepticism, Ohio higher education officials are taking the first steps "to turn public universities into 'charter universities,' in which they could give up some state funds in return for more freedom from regulations." UC retirees at the Lawrence Livermore National Laboratory have returned to court to appeal a decision that cut them from the UC retiree health care system after lab management was taken over by a consortium, which included UC, in 2007. Health insurance premiums and co-pays were raised after the transfer.